Long before I first tried any Thai food, I was a curry lover. When I was younger there was only 1 Indian restaurant in my home town, very originally named Taj Mahal. Went there many times, and the curries were served in big portions and not too expensive. Going for a curry is like an English tradition! Thank goodness for immigration! Here in Phuket there are a number of Indian restaurants, mainly at the tourist beach areas, and priced accordingly. There is one on the edge of Phuket Town called 'Bollywood' that I'd like to try sometime. 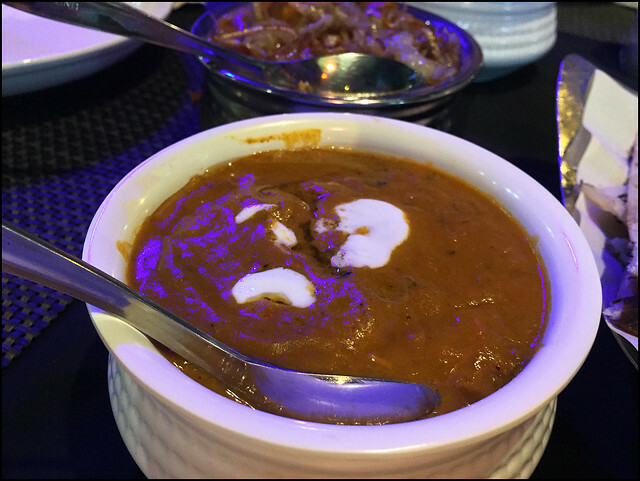 Of course if you love curry, then Thai food has many options too, but an Indian curry it totally different and I do like to east Indian every now and then. For a very unassuming roadside restaurant I was surprised how good the food was. And the staff were very friendly, price was good for this kind of meal. So .. went again this week, and rather tempted to go again soon! Yes, it was very tasty. Highway Curry is easy to spot with a big yellow sign by the road. There are tables outside and inside. We chose outside. The menu is big .. so many options with all the different styles of curry, various meats and a big vegetarian selection, plus all the side dish choices, a whole page of naan breads ... And, as I am sure you know, it's so easy to over order at Indian restaurants. A curry dish, rice, naan bread, bhaji, aloo gobi ... no, that's too much already! 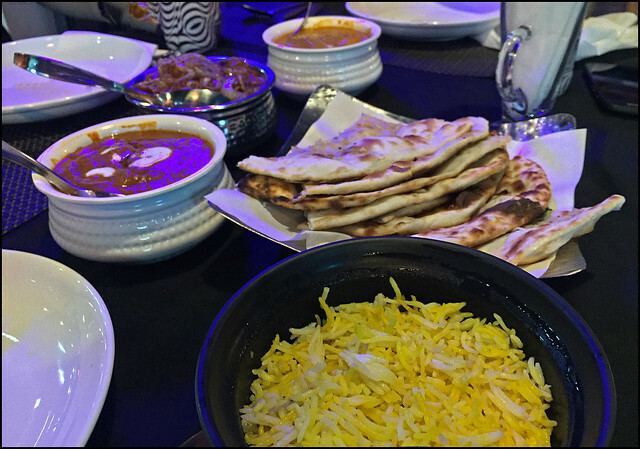 3 of us ordered a main dish each, plus some rice and naan to share and onion bhaji as a starter, washed down with a nice cold beer. 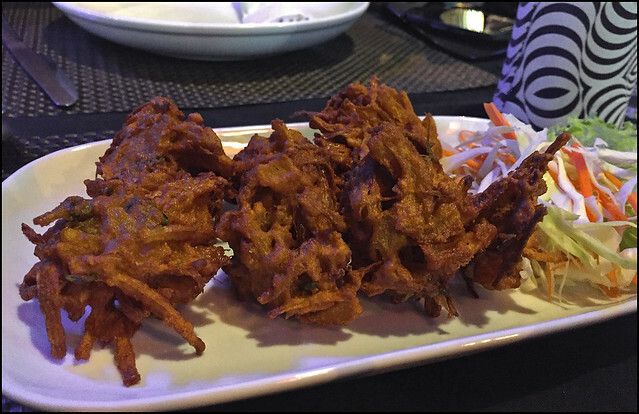 (above) Onion Bhaji - almost makes a meal for 1 person on it's own! 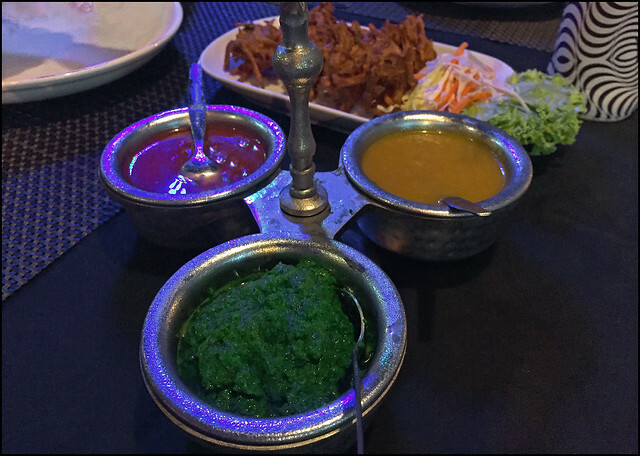 (above) And a selection of saucy things - tamarind, mint and mango dips for the onion bhaji. Food arrived pretty quickly - about 10 minutes wait for the bhaji, and the main dishes arrived a couple of minutes after we finished the starters. We all ordered something different. I had Rogan Josh (chicken, not lamb), the other guys had a Dopiaza and a Madras. You get these dishes that don't look too big .. but they are! (above) Close up of the Rogan Josh that I ordered. I want to eat more. Sure it's more expensive than eating simple Thai food, but I might treat myself to lunch here sometime soon! Our bill for 3 people with 2 beers each, 3 main dishes, and shared starter / side dishes was 1500 Baht. If I went and had a vegetarian main dish, no beer and a starter it would be around 300 Baht. In summary - recommended! 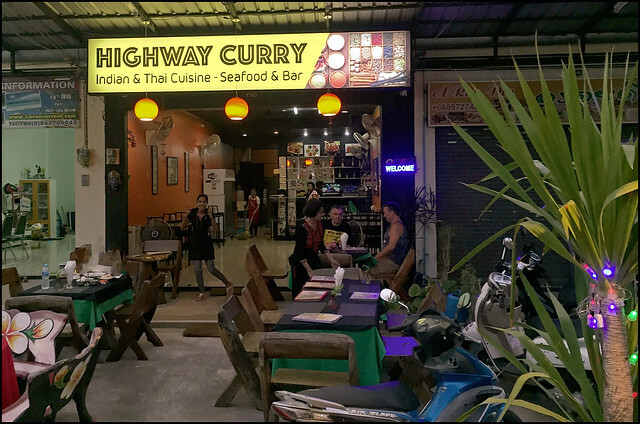 You can find Highway Curry online - the website @ highwaycurry.com or Facebook.